There are plenty reasons why Indonesia has become a ‘trending topic’ in terms of Takaful [which in Indonesia is known as asuransi Shariah (Shariah insurance)]. Firstly, with its 208 million-strong Muslim population, Indonesia cannot be ignored as one of the largest Takaful markets in the world. Secondly, there has been a growing awareness of the Maqasid (goal) Shariah. In addition, Takaful operators in the country have commited to mutual cooperation in order to explore alternative distribution channels to access the low income segment. Last but not least, the usage of information technology in Takaful distribution is promoting greater penetration. 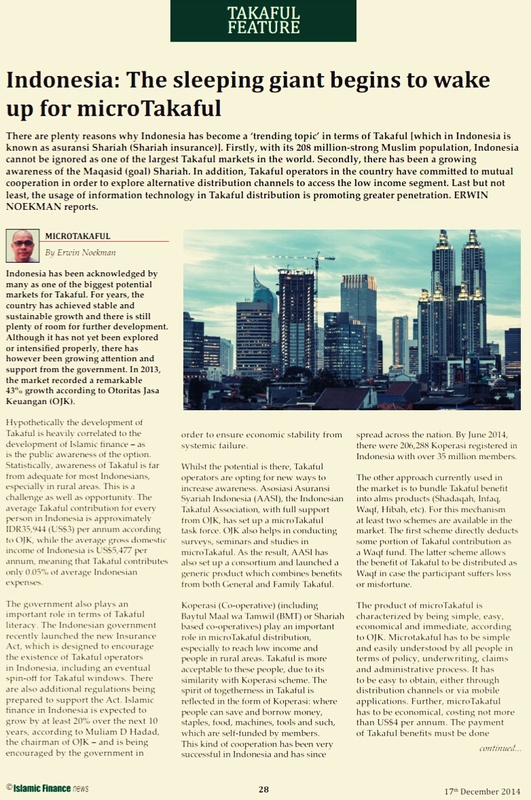 Indonesia has been acknowledged by many as one of the biggest potential markets for Takaful. For years, the country has achieved stable and sustainable growth and there is still plenty of room for further development. Although it has not yet been explored or intensiﬁed properly, there has however been growing atention and support from the government. In 2013, the market recorded a remarkable 43% growth according to Otoritas Jasa Keuangan (OJK). Hypothetically the development of Takaful is heavily correlated to the development of Islamic ﬁnance – as is the public awareness of the option. Statistically, awareness of Takaful is far from adequate for most Indonesians, especially in rural areas. This is a challenge as well as opportunity. The average Takaful contribution for every person in Indonesia is approximately IDR35,944 (US$3) per annum according to OJK, while the average gross domestic income of Indonesia is US$5,477 per annum, meaning that Takaful contributes only 0.05% of average Indonesian expenses. The government also plays an important role in terms of Takaful literacy. The Indonesian government recently launched the new Insurance Act, which is designed to encourage the existence of Takaful operators in Indonesia, including an eventual spin-off for Takaful windows. There are also additional regulations being prepared to support the Act. order to ensure economic stability from systemic failure. Whilst the potential is there, Takaful operators are opting for new ways to increase awareness. Asosiasi Asuransi Syariah Indonesia (AASI), the Indonesian Takaful Association, with full support from OJK, has set up a microTakaful task force. OJK also helps in conducting surveys, seminars and studies in microTakaful. As the result, AASI has also set up a consortium and launched a generic product which combines beneﬁts from both General and Family Takaful. Koperasi (Co-operative) (including Baytul Maal wa Tamwil (BMT) or Shariah based co-operatives) play an important role in microTakaful distribution, especially to reach low income and people in rural areas. Takaful is more acceptable to these people, due to its similarity with Koperasi scheme. The spirit of togetherness in Takaful is reﬂected in the form of Koperasi: where people can save and borrow money, staples, food, machines, tools and such, which are self-funded by members. This kind of cooperation has been very successful in Indonesia and has since spread across the nation. By June 2014, there were 206,288 Koperasi registered in Indonesia with over 35 million members. The other approach currently used in the market is to bundle Takaful beneﬁt into alms products (Shadaqah, Infaq, Waqf, Hibah, etc). For this mechanism at least two schemes are available in the market. The ﬁrst scheme directly deducts some portion of Takaful contribution as a Waqf fund. The later scheme allows the beneﬁt of Takaful to be distributed as Waqf in case the participant suffers loss or misfortune. The product of microTakaful is characterized by being simple, easy, economical and immediate, according to OJK. Microtakaful has to be simple and easily understood by all people in terms of policy, underwriting, claims and administrative process. It has to be easy to obtain, either through distribution channels or via mobile applications. Further, microTakaful has to be economical, costing not more than US$4 per annum. The payment of Takaful beneﬁts must be done immediately as the sum is urgently needed by the poor. Last but not least, we need to explore the importance of mobile applications in promoting Takaful. It is estimated by advisory group Redwing Asia that in 2014 there were more than 300 million mobile phones in Indonesia – outnumbering the total population of the country and suggesting that every Indonesian owns at least one device. Ironically, even people who are categorized as low income carry a mobile device on their hand. Correlated to this statistic, the usage of mobile applications in distributing Takaful is imperative. Nowadays, people tend to seek answers through search engines rather than ask advice from others – meaning that online media plays an important role in building image, and vice versa, defaming people or organizations. With its strong foundations and robust government support, the Indonesian Takaful market has the means to cope with the ongoing changes to the economic environment. The forthcoming ASEAN Economic Society will bring both challenges and opportunities for the market. 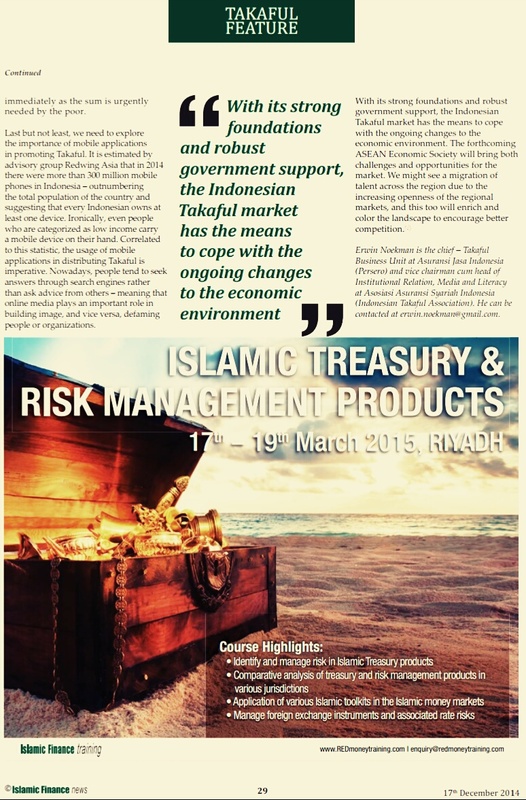 The article was published by Islamic Finance News on their 17th December 2014 edition – hopefully it’d be useful for all.